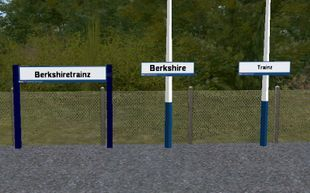 Signs and Station Furniture: Items such as departure boards, notice boards, station signs etc. 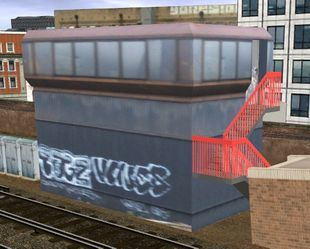 Station Buildings and Structures: Items such as station buildings, platform canopies, footbridges etc. 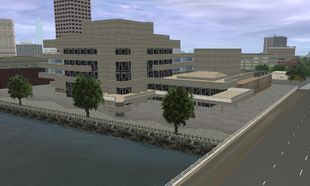 Buildings and Structures (Non Railway): Items such as office buildings to road bridges. 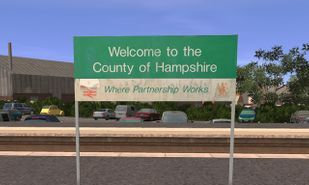 Description: Based on the NSE, Hampshire council partnership sign at the London end of Aldershot Station. 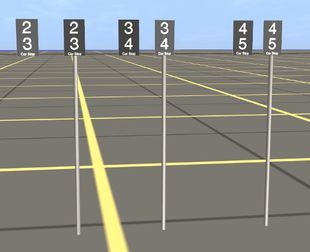 Description: Modern Departure Boards, based off the Thameslink Departure Boards. 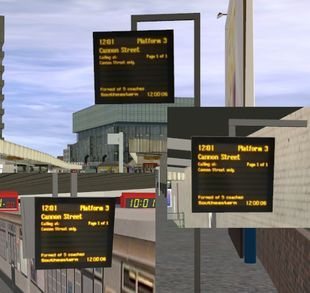 Description: Platform departure digital board of the type most commonly seen in South East England and South London. 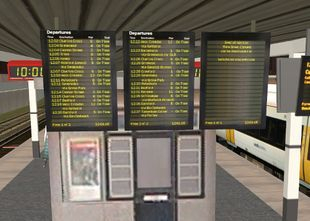 Description: Platform digital departure board type 2, as seen at most stations. Description: UK departure boards with bank of 3 screens. 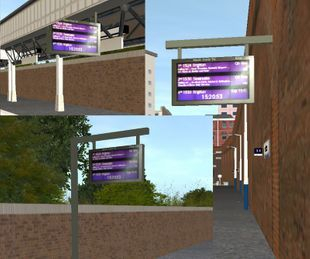 Description: A Set of Signs with First Capital Connect branding. 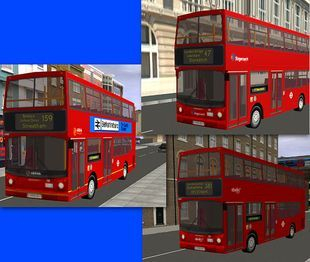 My thanks to Marky7890 and alexfleming380 for allowing me to reskin their signs. 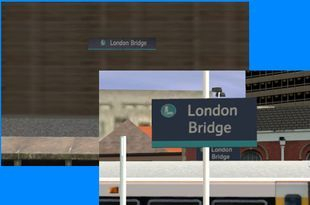 Description: London Bridge Station signs, wall and lamp mounted. 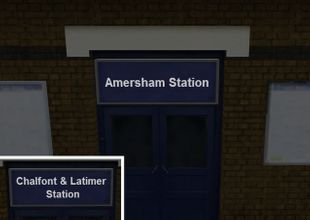 Description: Station Signs commonly used at the entrance of LU stations and joint BR/LU Stations. 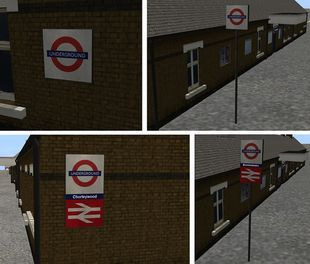 Description: Signs located commonly above the entrance to LU stations, both in single and double line variants. Designed to be used with my GC Met Station building series. 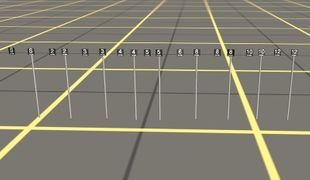 Description: Platform Stop markers, used to indicate to the driver where to stop on the platform. Description: Platform Stop Marker with two values, indicating to drivers where to stop on the Platform. 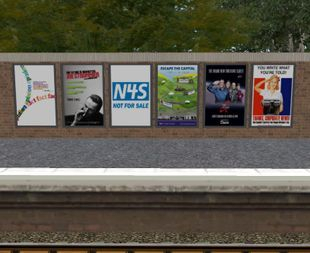 Description: A set of modern station posters, posters 1 to 6. 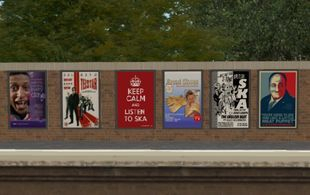 Description: A set of modern station posters; posters 7 to 12. 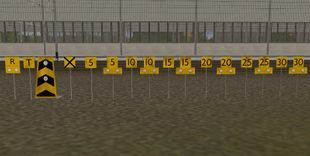 Description:Temporary Speed Restriction Boards, used when the ordinary line speed doesn't apply such as in areas of engineering possessions or accidents. 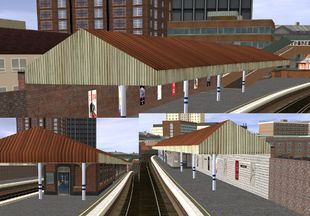 Description: Series of buildings and canopies based on Aldershot Station. 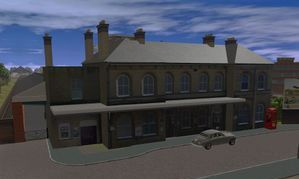 Description: Freelance Station building based on the example at Aldershot. However designed for it's use to be more flexible in other routes, than my other Aldershot Station Asset. 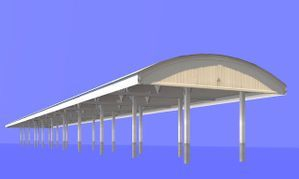 Description: Spline version of Aldershot Platform 2 3 canopy, designed for its use to be more flexible. Description: Various canopys based on designs found on the GC, Metropolitan Joint line from London to Aylesbury. 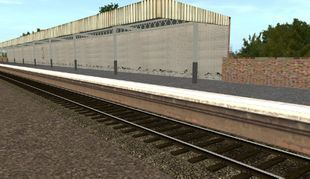 Description: Typical 1930s steel 'W' section Station Platform Canopys, Reskins of JayHollands work. 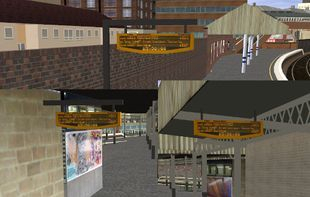 Description: London Bridge Station Canopies. 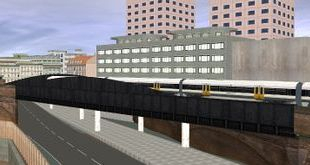 Description: By the early 70s the existing infrastructure at London Bridge could no longer cope with the volume of traffic passing through it. British Rail embarked on a major redevolopment of the station, which was completed in 1978. 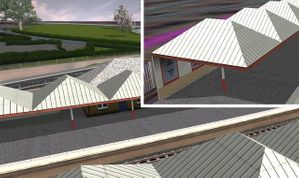 The work involved a new signalling system, a new station concourse and new platform canopies on the old SER side of the station. In 2012 the station concourse was steadily demolished to make way for the Thameslink 2000 project. 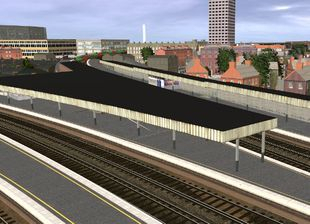 Description: The footbridge was contructed as part of the London Bridge station redevelopment that took place between 1976 and 1978. 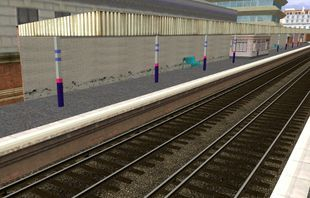 Description: Trackside cabin situated at the western end of Platforms 1 - 2, London Bridge Station. 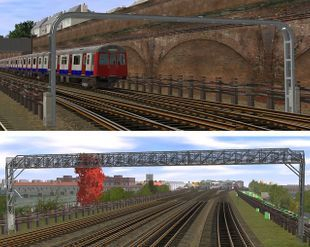 Description: Joiner Street railway bridge that lies just to the west of London Bridge Station, it carries the western station throat across Joiner Street. 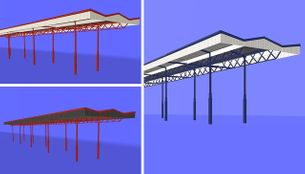 Description: Platform Canopies in First Capital Connect colours. 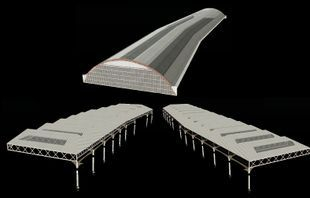 Description: Platform Canopies with white pillars. 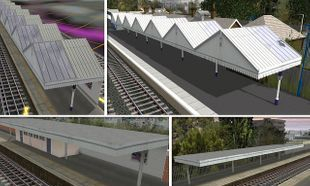 Description: Platform canopy designed for stations situated on vee junctions. 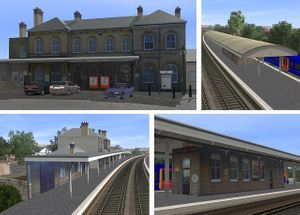 Description: Station Buildings based on various examples on the Marylebone to Aylesbury line. LH version has left hand entrance, RH version has right hand entrance. 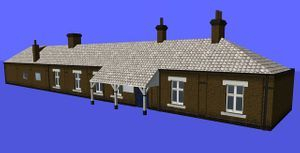 Description: UK station building based on the GC Met joint line design as used at Chalfont & Latimer. 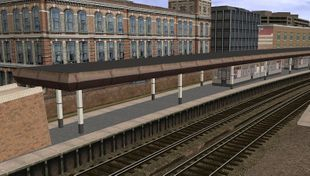 Description: Waterloo East Platform Canopies. 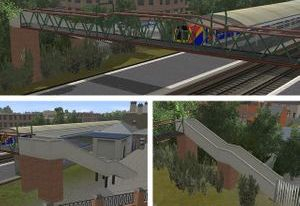 Description: Non station use Pedestrian Footbridge, based on examples found at Aldershot, Tongham, Badshot Lee and elsewhere on the Southern Region. 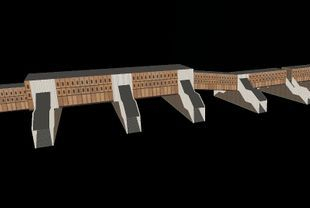 Description: Flexible Tunnel kit, designed to be able to create as wide a variety as possible tunnel combinations. 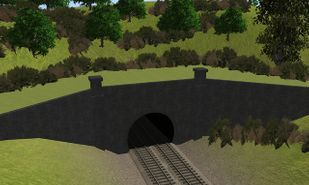 Works in a similar way to AJS's tunnel kit, however there are a number of differences, such as tunnel sections are splines rather track objects and track sections are separate. 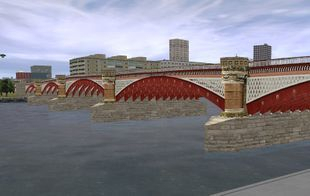 Description: Blackfriars Bridge was opened in 1869 to replace the previous bridge which suffered from poor workmanship. It has five cast iron spans, built to a design by Joseph Cubitt. In 1907 due to congestion, the bridge was widened from 21m to 32m. 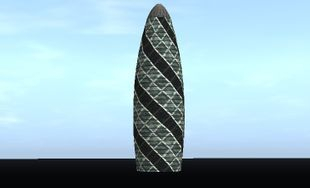 Description: The Gherkin Skyscraper, aka 30 St Mary's Axe, stands at 180m tall, making it a very prominant feature of London's skyline, Construction took around 3 years and opened in April 2004. It was built to a very unusual circular design earning it the nickname'The Gherkin' due to the towers unconventional shape. 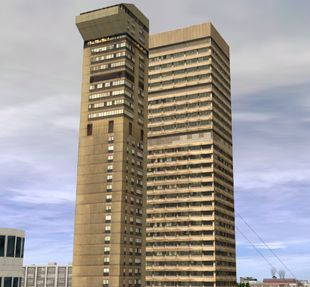 Description: Guys Hospital Tower, also known as Tower Wing was built for the NHS to extend Guys Hospital. Construction started in 1968 and finished 1973. The Tower was 142 metres tall until 2013 when after an extensive refurbishment gained a 'light sculpture' which extended its height too 148m making it the tallest hospital building in the world. 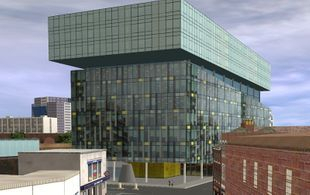 The refurbishment also involved recladding the building to make it look more modern. This model depicts it in original condition as it was between 1973 - 2012. 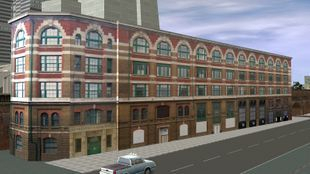 Description: The Ex Southeastern Railway offices, designed by Charles Barry Junior on Tooley Street is an unmistakable design, nicknamed the 'flat iron' due its shape, it was also home to the Britain at War mueseum which has recently moved out of the premises. It is currently threatened with demolition. Description: The National Theatre, formally known as the Royal National Theatre on Londons Southbank was built from 1963 to 1976, designed by the architects Sir Denys Lasdun and Peter Softley, the building is uncomprimisingly brutalist and draws a number of controversial opinions. But no matter what the opinion, it can be agreed the building is a very distinctive feature of Londons South Bank. 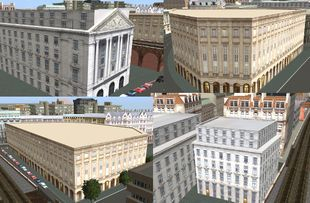 Description: A set of Generic Neo Classical design buildings found in most cities worldwide. 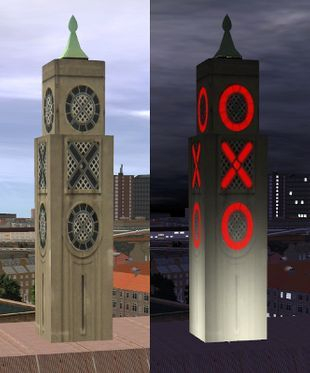 Description: The Tower was built between 1928 and 1929 on top of the Liebig Extract of Meat Company, (manuafcturers of the Oxo cube), cold storage warehouse. Liebig wanted to include a tower featuring illuminated signs advertising the name of their product. When permission for the advertisements was refused, the tower was built with four sets of three vertically-aligned windows, each of which 'coincidentally' happened to be in the shapes of a circle, a cross and a circle. The tower survived proposals to demolish it in the late 70s and 80s and was subsequently restored along with the warehouse into a restaurant, shops and an exhibition space. Description: 197 Blackfriars Road in Southwark London, also known as Palestra house was designed by Will Alsop and Buro Happold, opened in 2006 it was built to a very striking modernist design, to replace the previous 1960s concrete office block. Currently it serves as an office for Transport for London. 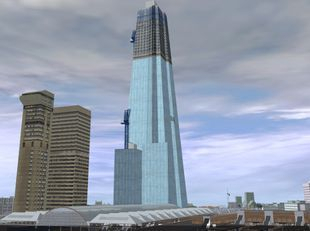 Description: The Shard, also known as London Bridge Tower is Britains tallest building and is a dominant feature of Londons Skyline. Construction started in March 2009 and was opened to the public in February 2013, completed it stands 309 metres tall and has 72 floors. The building is represented as it was in the summer of 2011, still under construction. 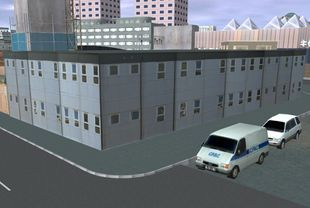 Description: Site offices as used on large building sites. Description: St Pauls Cathedral is one of the most world renowned landmarks in London, designed by Sir Christopher Wren, the cathedral was built as a replacement for the one burnt down in the Great Fire of London. At 111m it was the tallest building in London until 1962. 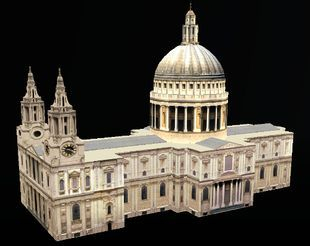 Please note this is not an accurate recreation of St Pauls cathedral, it's mostly designed as a background model. 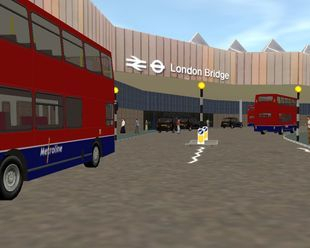 Description: The Waterloo Bridge in London as designed by Sir Giles Gilbert Scott, was opened in 1945 to replace the orignal 1809 bridge, which had serious structural problems. 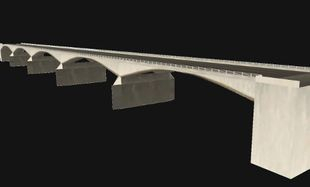 The bridge was of a box girder construction, clad in reinforced concrete and Portland Stone to make the beams look as much like arches as possible, resulting in a clean, sleek, functional looking bridge.